A farmer in Maenbi, Lhuentse has started producing seeds for commercial purpose. Thanks to him, people in his village do not have to depend solely on the gewog agriculture extension office for vegetable seeds. 50-year-old Tshagayla ventured into large-scale seed production in 2003. He had attended trainings on seed production and packaging prior to taking up the business. Initially, he had to battle several hiccups. “I attended seed production training at Wengkhar 15 years ago. But I had to discontinue the production in between due to a labour shortage. And in 2016, I was again invited to attend training at Wengkhar. After that, things went well,” he said. Unlike in the past, his vegetable seeds are now well packaged. This year, he is expecting to produce nearly 2,500 packets of various seeds and earn around Nu 40,000. 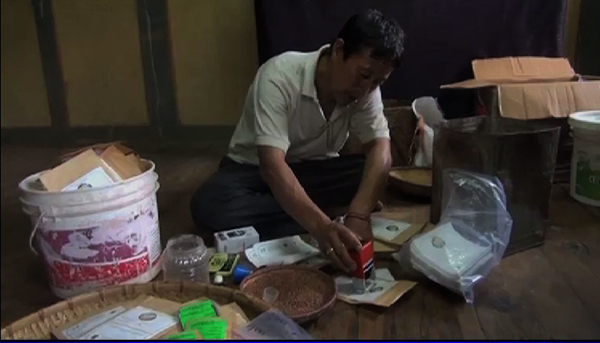 The gewog’s agriculture extension supervisor, Phub Dem, helps in marketing Tshagayla’s seeds. “I am in discussion with the school agriculture program coordinators of central schools to sell Tshagayla’s seeds. The coordinators are positive about the idea. I am also going to ask the authorised seed distributors in the gewogs to buy his seeds,” Phub Dem said. She added Tshagayla’s initiative has come to the rescue of the gewog agriculture extension office. Like Tshagayla, there are 27 vegetable seed and fruit nursery growers in eastern Bhutan. The Agriculture Research and Development Center (ARDC) in Wengkhar with support from the Japan International Cooperation Agency (JICA) and International Fund for Agricultural Development (IFAD) help farmers in establishing and upscaling such projects.